Pamela Shellberg (March 2015). Posted in 21stCenturySpirituality. It was the bright yellow color of the lobster traps that caught my eye at first, but it was the symmetry of the stack that held my gaze—small yellow squares forming bigger blocks, bigger blocks creating a large cube, the repeating patterns of the wires, of the green net funnels, and of the heavy rope handles on the sides of each trap. Just as I was about to look away, I had some perception of motion in and around the traps, although I couldn’t tell what was moving. So I took a few steps forward and saw a few little birds hopping and fluttering about. But then, as I moved in closer, I realized the movement was everywhere—on the traps, around the traps, and even far inside them. 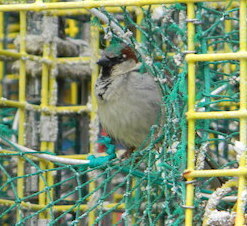 The stack of lobster traps was teeming with sparrows. The whole scene quivered a little bit, like a mirage in the heat rising off hot pavement. I felt a little bit dizzy and wobbly—disoriented by lobster traps turning into birdcages, by feeling myself no longer on a seaside dock but instead in the aviary at a zoo. Except the traps weren’t exactly like birdcages either. All those yellow wire squares and green net funnels allowed movement in and out of the traps, allowed the sparrows to fly far away from the stack as well to hop more deeply into it—just like they were moving in between apartments in a high-rise building or in and out the front door of a college dormitory. And then it occurred to me—in a second wobbling and dizzying moment—lobster traps are traps only to lobsters, but to birds they are something quite other. To a sparrow the traps are not traps or even cages, but rather they are places to find birds of a feather, a playground, perches for resting and protected sleep, places from which to take flight. New narratives, alternative narratives, reshaping narratives. This sounds like a clarion call to those who are dying in and under old narratives, those traditional storylines with all too familiar and easily-recognized shapes. But to answer such a call is to meet with powerful resistance (perhaps within our interior selves, as well as out in the world) to the notion that our biblical stories, the stories of our faith traditions, the stories of our church can be or should be reshaped. New narratives, alternative narratives, reshaping narratives. This sounds like a clarion call to those who are dying in and under old narratives, those traditional storylines with all too familiar and easily-recognized shapes. What does this have to do with lobster traps and sparrows? Admittedly, there is not much at stake in seeing lobster traps in a new way—except for maybe this: how the experience of it offered up a demonstration, in a physically palpable way, of the tension between continuity and discontinuity in moments of change . . . of what it actually “feels” like to be caught in a paradigm shift . . . of the grace of imagination. This isn’t merely a matter of semantics. I hadn’t just found a more colorful way to describe what those traps looked like. No, it was something different, something bigger, something more complicated. And it had to do more with the sparrows than with the traps. Because of the similarity of trap to cage, and because the little birds were not actually confined in them, the meaning I had always assigned to wire box structures couldn’t hold, didn’t make any sense. My traditional understanding of “wire boxes” gave way, and the sparrows became a symbol of resistance to any certainty I might possess about what I think I see and what I think I know. “Lobster traps” and “birdcages” and “sparrows” can never mean the same things to me again—and they will always mean more than the words can hold. I have put a photograph of those birds and traps on my bathroom mirror to remind me: traps are only traps to lobsters, but not to those who are brave enough, free enough, creative enough, and broken enough to see themselves as sparrows. This isn’t merely a matter of semantics. I hadn’t just found a more colorful way to describe what those traps looked like. No, it was something different, something bigger, something more complicated . . . My traditional understanding of “wire boxes” gave way, and the sparrows became a symbol of resistance to any certainty I might possess about what I think I see and what I think I know. Seeing lobster traps turn into an aviary before my eyes was magical, a little joyous—and mysterious in a soul deepening kind of way. But there have been other dizzying and disorienting moments when it was the narrative of my life that shape-shifted, and the loss of dearly held meanings have left me grief-stricken or frightened. Like when I relocated to Maine—having lived nowhere else except the Midwest for 50 years—arriving alone, knowing no one, with a new job like none I’d ever had before, distanced from the relationships in which I was certain of my purpose and identity, displaced from the physical geography I knew to be home. Feeling like I could be airbrushed out of any moment just like an opening scene from the television mystery show, “Without a Trace,” and no one would even notice I’d gone missing. Like when I walked out of the meeting having received the news that Bangor Theological Seminary would close its doors as a degree-granting institution, trying to comprehend that the work in which my educational commitments, my theological convictions, and my passion for the church had come into a perfect confluence would not continue. Like when I, the poster child for school, whose entire life has been patterned on academic calendars, hear compelling critiques of educational institutions and persuasive arguments for alternative educational delivery systems and I actually feel a bit of creeping shame at my impulse to be an apologist for the status quo. Like when I sit in church and ponder how the sacraments, rituals, litanies, liturgies, hymns—and all things Scandinavian Lutheran—that have ordered my religious practices and defined my spiritual life do not speak now to other searching hearts in the same way they always have for me; when I am challenged to imagine a different kind of future church and realize that what for me has always meant “flight” and “life” has come to mean “trap” and “death” to many others. In these moments, calls for new narratives have sounded more a threat to me than a clarion call; as prior meanings begin to give way, there has been no quick insight, no magical shift of perception offering me an easy hold on continuity to my storylines as I am confronted by the reality of their discontinuity. We live in and by our senses, which are conditioned in and by our deaths. When some singular aspect of our reality—an object, a person, even a duration of time—seems to acquire a life in excess of itself, what we feel is more complicated than joy. This is because that excess is at once some inexplicable ongoingness of the thing and the loss of the thing as it is, at once eternity and oblivion. I look with hope at the photograph on my bathroom mirror every day, because I am aware of motion on the traps, around the traps, and even far inside them—an excess of life, an ongoingness. Even as I struggle to see in myself a sparrow. Dr. Pamela Shellberg is the Scholar-in-Residence at The BTS Center, crafting “Course Corrections,” a program for imaginatively responding to changes in the church and in life based on the biblical template of Paul’s life and writings. During the 2015-16 academic year, Pam was the visiting professor of New Testament studies at Andover Newton Theological School, jointly appointed by ANTS and The BTS Center. She is the author of Cleansed Lepers, Cleansed Hearts: Purity and Healing in Luke-Acts (Fortress Press, 2015). 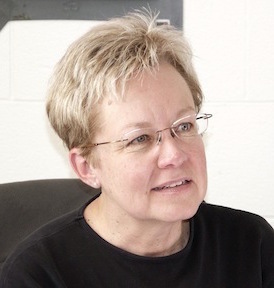 A teacher in schools for lay ministry in the Maine Conference of the UCC and the New England Synod of the ELCA, she thinks and writes about the metaphors in poetry, art, and music as lenses for bible reading and as tools for interpretation. Pam may be reached via e-mail. “Lobster Traps with Sparrows,” courtesy of Pam Shellberg. All rights reserved / Cropped from original. “Sparrow in Trap,” courtesy of Pam Shellberg. All rights reserved /Cropped from original.